One of the main treatments for attention deficit disorder is stimulant medications. Although these may be helpful in relieving symptoms, they can also lead to other serious ailments, especially in cases of misdiagnosis. This is why it is important to investigate all possible causes of symptoms. • Malnutrition. If children do not get adequate nutrition, especially during the first year of life, they may not develop properly. This can cause problems with brain development and function, and lead to a potential ADHD misdiagnosis. Make sure your kids are getting all of the recommended fruits and vegetables necessary to fuel the body. • Food Reactions. The Feingold diet for children with attention and behavior problems is based on eliminating foods with salicylates, artificial dyes, and certain preservatives. It reportedly has a high success rate for improving symptoms due to the child reacting to these substances. • Candida Overgrowth. Brain fog, learning difficulties and irritability are just a few of the common signs similar to ADHD that may cause a misdiagnosis. • High IQ. Some children will appear is if they are having attention problems when they are not given work appropriate to their intellectual level. This can make the child become bored and disinterested in regular class assignments. Although I likely did have attention deficits growing up, one of the biggest reasons I had a hard time paying attention is that the work was too easy for me in class! It was only by the grace of my mom knowing I could do everything they were teaching and talking to the teacher to put me in an accelerated math program that I was able to adequately pay attention to the material being taught. You might be surprised how many kids are in this exact same situation! • Overstimulation. Excessive television watching, video game playing, and computer activity can cause a child to become overstimulated. As a result their ability to pay attention and focus is severely compromised, especially if there is actually an underlying sensory disorder. 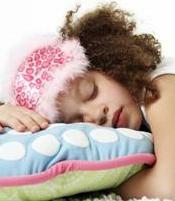 • Poor Sleeping Habits can lead to an ADHD misdiagnosis. If a child has problems sleeping and isn’t getting the recommended hours of sleep for his/her age, this can lead to difficulties concentrating, hyperactivity, and ultimately a misdiagnosis. • Abuse or neglect. Emotional impairments that often result from abuse and/or neglect can cause a child to have behavior problems. • Sensory Processing Disorder. Sensory disorders have symptoms very similar to attention deficit hyperactivity disorder, especially the subtype known as sensory seeking. • Stressful home environment. Changes in the home or recent crises, such as divorce or a death of a loved one, may cause a child to behave differently than usual. Children can become confused and scared when there are drastic changes in their lives leading to symptoms and an ADHD misdiagnosis. • Parenting skills. Sometimes parents have not been given the right tools to effectively handle difficult-but typical child behavior. If there are inconsistent consequences or parents are not confident in their parenting abilities, their child may develop challenging behavior. • Lead Exposure - Even small amounts of lead can cause similar symptoms causing an ADHD misdiagnosis. • Other medical conditions. Food allergies, asthma, and thyroid disease often cause symptoms similar to attention deficit hyperactivity disorder if they are undetected. Medications for asthma or other medical conditions may also have side effects that include hyperactivity and difficulties concentrating. Investigating all of your options and learning how to diagnose ADHD properly is very important, especially when that diagnosis will often lead to the use of psychotropic medications for an extended period of time. We had originally thought that our son may possibly have symptoms of mild autism or ADHD symptoms, which could have very possibly led to a misdiagnosis. Finally, we had him evaluated by an occupational therapist and learned it was actually a sensory disorder. All of his treatment so far has included natural treatments, many of which I believe would be extremely beneficial for all children with attention and hyperactivity problems. We modified his diet, limited his access to television, took him for regular chiropractic work, added supplements and avoided over-stimulating activities, all while implementing a sensory diet with great results. I am proud to say that he is doing extremely well now! Most people would never have known he had so many issues growing up and he is doing great in middle school despite the need to organize going to classes etc. 1. Curtis, J. (2008). Other conditions with symptoms similar to attention deficit hyperactivity disorder. www.webmed.com. 9-28-10.